Tektronix, Inc., a leading innovator of signal generation and analysis solutions required for the microwave and RF industry, has introduced a family of compact RF and microwave power sensors/meters that feature the industry’s fastest measurement speed, cover a wide frequency range, and provide extensive power measurements from basic average power to pulse profiling. The Tektronix PSM RF Power Meter Series come fully calibrated over their entire operating temperature range, eliminating the need for sensor zeroing and meter reference calibration. 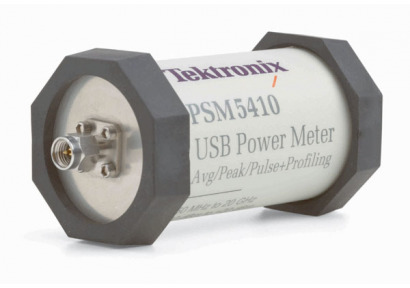 The new Tektronix PSM3000, PSM4000, and PSM5000 Series are compact USB power sensors/meters that can be used for a broad range of CW and pulse modulation measurements depending on the model selected. The meters are delivered with Microsoft Windows-based power meter application software for controlling the meter, displaying readings and recording data. This combination provides a complete test solution, eliminating the need for a separate meter mainframe. Accurate power measurements have emerged as an absolute requirement in RF and microwave design and manufacturing. While testing of RF products has become faster and easier over the past several years, testing RF power still remains one of the most basic and time consuming tests. This has led to a market need for more capable, compact power sensors/meters such as the PSM Series. Series products are highly versatile thanks to a wide dynamic range (–60 dBm to +20 dBm) and frequencies ranging from 10 MHz up to 26.5 GHz. Zero and calibration are important considerations since these requirements can cost time and add incremental expense, especially in automated test systems, where every second is valuable. The Tektronix PSM sensors employ a patented technique to ensure stability and calibration over the entire temperature range, which makes them more accurate over varying ambient temperatures than any other sensor on the market. Other power sensors require time-consuming disconnecting or zeroing and frequent calibration. PSM3000 Series RF power meters provide true average power measurements, giving accurate power measurements independent of signal modulation and bandwidth. The PSM4000 Series delivers average power (CW) measurements, and adds pulse and peak power measurements for gathering basic data on pulsed RF and microwave signals. PSM5000 Series power sensors/meters provide the same measurements as the PSM4000, and add pulse profiling capability for signal viewing and characterization in pulsed RF and microwave systems. Tektronix PSM Series RF power sensors/meters are available now worldwide and start at $2,590 US MSRP. Tektronix is a widely recognized piece of hardwares. It powers sensors from lifts to levers in automatic doors.